Judy's Stamp Art: Loverly New Stamps In the Month of Love! Loverly New Stamps In the Month of Love! 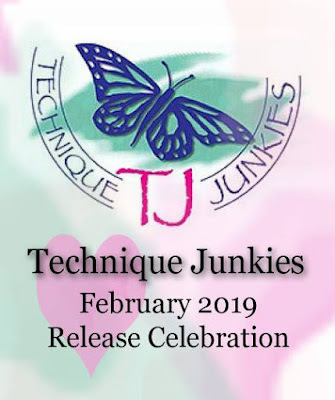 And today is the wonderful release day for Technique Junkies February Release stamps. And we have a Blog Hop! See the entire line up of Design Team's blog web addresses near the bottom of this blog post. While this is the month we designate to celebrate "Love" -- love can be all kinds of love not just romantic love, but love for your children, love for your grandchildren, and love for your friends. So I have some cards for you on this release day to celebrate love which enriches our lives in all kinds of ways. 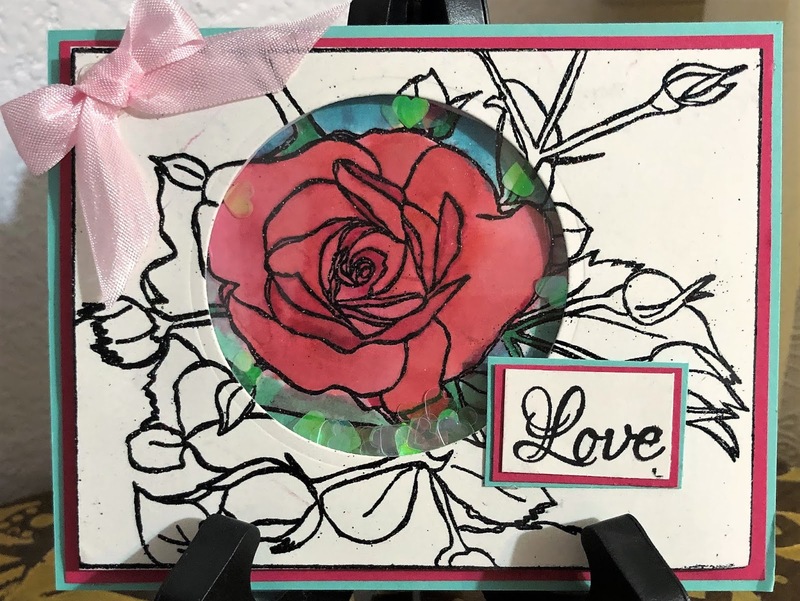 My first card uses the Technique Junkies stamp - Rose Frame. I stamped it twice. Once for the top layer of this shaker card and once for the underneath layer of this shaker card. I saved the die cut section of the rose from the top layer for another card which I will share with you later this month. On a nonporous surface I sprayed a couple of shades of pink and red Technique Junkies Shimmering Bliss sprays. I used the pooled sprays to watercolor the rose and some green and blue sprays to finish the painting. I used foam strips to lift up the top layer with acetate secured under the window. Then I put some iridescent hearts in the area for the shaker items. I used just the word LOVE from the Technique Junkies stamp Duty of Love. I spritzed the top layer with Technique Junkies Shimmering Bliss Dazzle Topper Spray before securing the acetate in the window. For my second card I used a stamp from the Technique Junkies Stamps January release called Joy in Your Journey. 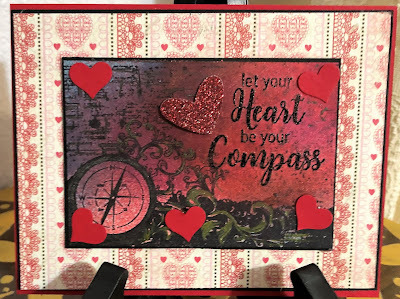 I cut out the words from the stamp and positioned the new Technique Junkies Stamp called Heart Compass in the upper right hand corner. But that eliminated some of the "skritches" found on the Joy in Your Journey stamp. So i used just sections from the Technique Junkies Wasted stamp to fill in the blank spot. I sprayed the top of the stamped image with a few colors of Technique Junkies Shimmering Bliss Sprays. Then I used Nuvo Glitter Markers to highlight different areas on the stamped image. 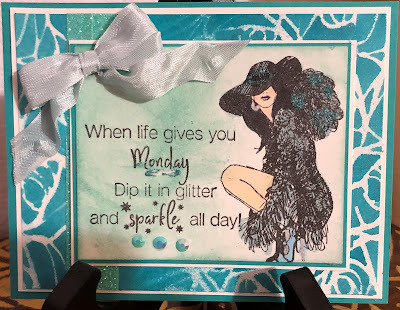 I used an elegant embossing folder sprayed with Shimmering Bliss Dazzle Topper Spray to give it a glistening look. The newly released Technique Junkies Stamp Just A Hug on pink card stock I used a Nuvo Glitter Gloss Aqua Pen to add shimmer to the heart. I wrapped the embossed panel layer with pink ribbon, added a bow, and adhered the cut out heart. 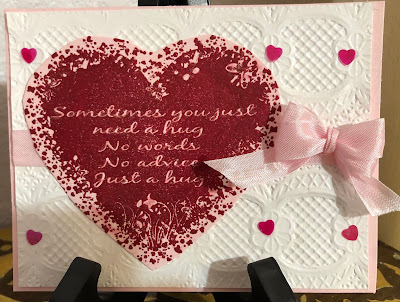 And here is one more card and it does not feature hearts or "love." When I saw this newly released Techniques Junkies Sparkle All Day stamp, I immediately thought of this lady and her (as I view it) sparkly outfit! The Technique Junkies lady stamp is from the set The Rules. I used the A Colorful Life Stencil called Scribble Roses. To add color to both stamp and the stencil I used Shimmering Bliss Mermaid spray, and Nuvo Glitter markers. You save 10% on your non-February release purchase today by using the code TJ10 Judy. 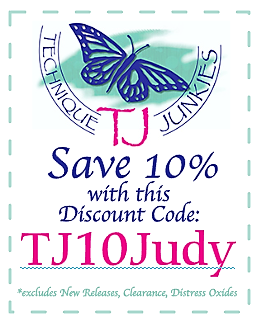 And if you want to save money on the Technique Junkies February Release stamps -- there is good news for you! All of the Technique Junkies February Release Stamps are 15% off through February 8, 2019. So you have two ways to save some money here. Please go shopping! Have a great day and get inky! 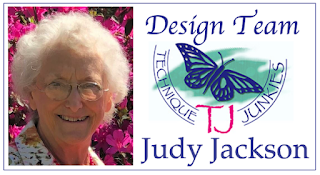 Beautiful cards, Judy, as always! Fabulous work. That rose card is so unique. I really like the compass card. Very creative. 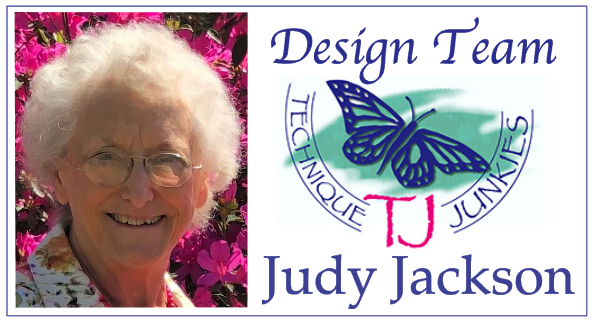 All photos, words, and content unless otherwise indicated are © Judy's Stamp Art. Pinterest sharing is allowed. The European Union is requiring bloggers to post a notice about the use of “cookies.” Google uses “cookies,” but I, personally do not. I have no idea how Google uses “cookies” but this is their policy for European visitors: https://www.google.com/about/company/user-consent-policy-help.html. I am not a business and do not own a business but I do advertise for a business. 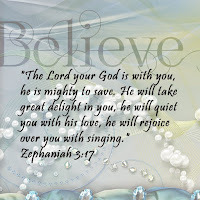 At any time you may opt out from subscribing to this blog.